Elevating soft to an art form, the Franklin Padded Glove Leather Guitar Strap offers a soft feel and total comfort on stage. The strap begins with a soft core of top quality suede. Franklin then places a wafer of foam on the top of the suede and then wraps it with their plush glove leather. Wrapping the glove leather around the suede achieves a rolled look that will remind you of the deep, tufted custom upholstery you would find at a classic car show. Adding another wafer of foam on the back, under more glove leather, enhances the upholstered look and feel to an extravagant level. 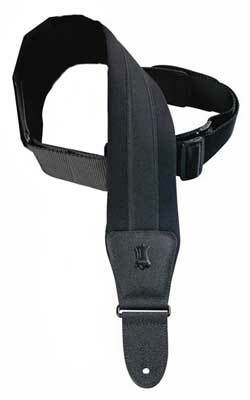 Adjustable from 39 to 56 inches, this ultra comfortable strap ensures hours of enjoyable guitar playing! Guitar players and musicians are wearing their favorite skate brands from skate park to the stage. Dunlop straps teamed up with four skateboard industry giants (Independent, Santa Cruz, NorCal and Skateboarding is Not A Crime) to bring you the SK8 series of rugged and comfortable straps. Dunlop has taken the iconic logos and dropped them onto your favorite straps which feature leather ends and Dunlop's patented Comfort Edge. The Levy's PM48NP3 is a 3 1/2 inch neoprene padded guitar strap with leather ends. Also has 2 inch polypropylene webbing with tri-glide adjustment at back end. A great leather strap with a rich look and feel.